Appropriate quote from #MarkTwain to open the film. How to #Hijack a #SupportGroup. I learned more about #SubprimeLoans from @MargotRobbie in a #Bubblebath than any news story...and I liked it. A #Short deal for 100 million. #GoldmanSachs is laughing now. #CDO is like three day old halibut. Love the visual illustration by #AnthonyBourdain. Four people per 100 houses in FL. There are more alligators per capita...like the one in the swimming pool. They’re not confessing. They’re bragging. Pride comes before the fall. “Fueled by stupidity.” The short definition of our entire system. “A completely fraudulent system.” Imagine that. #SyntheticCDO Atomic bomb to the #SubprimeBubble. “I say when we sell.” Phenomenal acting by @SteveCarell. Final analysis: a sobering look at greed run amok with amusing direct addresses and educational sidebars. Rating: 3 1/2 out of 4. 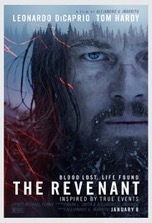 Superb acting with an educational, accessible story from writer/director Adam McKay. As Gordon Gekko (Michael Douglas) enthusiastically declared in Wall Street (1987), “Greed is good.” However, when a glut of greed causes an entire financial institution to become fraudulent, which in turn threatens to crash that nation’s economy, greed most definitely isn’t good. 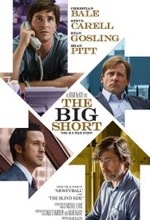 The Big Short is based on the book of the same name (subtitled: “Inside the Doomsday Machine”), written by Michael Lewis, and chronicles the events that precipitated the financial meltdown in 2008. Just like other movies that have focused on the subject at hand, i.e., HBO’s Too Big to Fail (2011), Short is less an entertainment than a cautionary tale wrapped inside a biopic. If the movie’s subject matter conjures images of a dry, narrated documentary, you’ll be pleasantly surprised to learn that Short is nothing of the sort. Writer/director Adam McKay (Anchorman, 2004) has done a superb job of describing complex financial concepts in layman’s terms, and has employed luminaries like Margo Robbie, Anthony Bourdain and Selena Gomez to explain those concepts in amusing vignettes. As in the similarly themed The Wolf of Wall Street (2013), Short allows numerous characters to break the fourth wall and address the audience in supplemental, anecdotal or humorous asides. All of these story devices lend the film a unique narrative flow, which makes it accessible to a mass audience and prevents it from degenerating into a derivative snore-fest. The cast is headlined by Brad Pitt, despite the fact that his character is ancillary to the action and his screen time is far less than many of his co-stars. Christian Bale is extremely effective as glass-eyed, socially awkward hedge fund manager Michael Burry, the first person (according to the movie) to bet against the housing market. The most impressive (and unexpected when considering his typical role) performance is turned in by Steve Carell, who plays Mark Baum, the low empathy, high maintenance ringleader of a small team of renegades inside Morgan Stanley. The freeze-frame shot of Baum’s face when he learns about Synthetic CDOs perfectly mirrors our own expressions of confusion, disbelief and betrayal. For scores of people who were adversely affected by the bursting of the “credit bubble,” it will take the rest of their life to wipe that look off of their face. If Short has done its job properly, you should leave the theater furious over how the banks have destroyed millions of lives and very nearly tanked our economy. Short is an important film, not only as an edutainment, but also as a reminder for us to never again commit this kind of financial blunder…as is hauntingly hinted at in the final scene of the film. “Banging heads...it’s not a natural thing.” Sounds like the movie’s central thesis. “The science of death.” Macabre study. Takes a special person. “Those are my peaches. They should not be there.” LOL! “I’m dying in here!” Some amazing acting by #DavidMorse. “One should eat breakfast in this country.” Got him! The jar illustration is downright frightening. “God did not intend for humans to play football.” Scientifically accurate, but not a popular view among fans. Bennett finally gets to speak about concussions. Final analysis: a sobering look at the dark reality of America’s favorite pastime. Rating: 3 out of 4 stars. A transformative performance by #WillSmith in a David vs Goliath tale of courage. During a conversation focused on the growing problem of head injuries in sports, Alec Baldwin (as Dr. Julian Bailes, former team doctor for the Pittsburg Steelers) makes this statement about American football: “It is a mindless, violent game, and then it’s Shakespeare.” This ironic dichotomy not only serves as the film’s underlying premise, it also effectively expresses the ambivalence felt by many players and fans who must grapple with the bitter reality that the fun and exhilaration they derive from the popular pastime comes with a price. By dint of its classification as a contact sport, you can’t have a high level of excitement without punishing tackles and vicious blows to the head. And yet, most people, especially with what we now know about the sport’s potentially devastating effect on the brain, would agree that we must do more to protect football players from TBIs (traumatic brain injury) or, as Dr. Bennet Omalu (Will Smith) discovers in the film, CTEs (chronic traumatic encephalopathy). Omalu first encounters the disease while conducting extensive tests on the brain of legendary Steelers center Mike Webster (David Morse). As Omalu continues conducting autopsies on deceased football players, he detects a pattern which becomes the basis for his landmark journal article, which leads to an official diagnosis (CTE), which generates skepticism from many in the medical community and outright hostility from the NFL…after all, it owns a day of the week. As ironic as it seems, discovering the degenerative condition inside players’ brains turns out to be a far easier task for Omalu than convincing the NFL of his findings. What kicks off as a standard sports movie morphs into a medical procedural and ultimately ends up as a David vs. Goliath political thriller. Above all, Concussion chronicles one man’s dogged pursuit of the truth and the considerable diametrical forces that attempt to discredit and squelch his work (this struggle of opposing views is not too dissimilar from the basic arrangement of players on the football field: offense and defense). Smith turns in a remarkable performance as Nigerian pathologist Omalu and absolutely nails the accent. The supporting players are also extremely effective in their roles, especially Morse, whose portrayal of the deteriorating NFL star is heartbreaking and haunting. Honorable mention goes to: Baldwin, Albert Brooks (as Omalu’s supervisor), Gugu Mbatha-Raw (as Omalu’s wife) and Luke Wilson (as NFL commissioner, Roger Goodell). One wonders how much interference director Peter Landesman encountered while spearheading this even-handed effort to expose the ugly truth of the NFL (in specific and football in general). 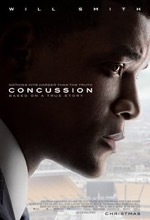 With the considerable connections and bankroll the league has at its disposal, it’s a minor miracle that a movie like Concussion ever made it to the big screen. And the fact that the film was released on Christmas Day, deep into the NFL’s regular season, shows that Columbia Pictures isn’t the least bit intimidated by the institution it’s brazenly indicting. I admire that kind of pluck, and, judging by his onscreen characterization, something tells me Omalu would too.